Director/Screenplay/Photography – Mark Atkins, Producer – David Michael Latt, Music – Chris Ridenhour & Andrew Morgan Smith, Visual Effects Supervisor – Joseph J. Lawson, Makeup – Robb Crafer, Production Design – Carl Waters. Production Company – The Asylum. Jack Mason is celebrating his eighteenth birthday when he is interrupted by a crazy man who says he was a friend of his Jack’s father and insists on leaving a package for him. When opened, the package proves to contain beans. Jack throws them away but is startled to later find they have grown into a giant beanstalk that stretches up into the sky. Jack is then snatched by the beanstalk’s tendrils and carried up to a strange land in the clouds. He takes refuge at a floating castle and meets its owner – none other than his father Newald Krutchens. Newald believes that only a few days have passed since he came to the land of the clouds and is amazed to see that Jack, who he left as an infant, is now a full-gown adult. In trying to find a way back down the beanstalk, Newald takes Jack to see the sorceress Selina in search of a solution. When Jack’s girlfriend Lisa Russell plants another beanstalk to come after him, Selina takes the opportunity to travel back down with her beasts. There she determines to subjugate the Earth below, with her beasts proving invincible to all military firepower brought against them. The Asylum is a company that specialises in ‘mockbusters’ – low-budget films that attempt to copy the titles of more successful big-budget studio releases and exploit their free publicity by being released at the same time, not to mention seek to fool unsuspecting browsers into thinking they are watching the other film. The Asylum’s mockbusters have included the likes of The Da Vinci Treasure (2006), Pirates of Treasure Island (2006), Snakes on a Train (2006), I Am Omega (2007), Transmorphers (2007), Allan Quatermain and the Temple of Skulls (2008), The Day the Earth Stopped (2008), Death Racers (2008), 100 Million B.C. (2008), Sunday School Musical (2008), The 18 Year Old Virgin (2009), Paranormal Entity (2009), The Terminators (2009), Almighty Thor (2011), Battle of Los Angeles (2011), Abraham Lincoln vs. Zombies (2012), Age of the Hobbits (2012) and Atlantic Rim (2013), among others. The Asylum have also jumped in before with various films adapted from classic literary works, including their own low-budget versions of War of the Worlds (2005), Journey to the Center of the Earth (2008), Sherlock Holmes (2009), 3 Musketeers (2011) and King Arthur and the Knights of the Round Table (2017) when the respective big-budget versions of these were made. They readily leapt aboard the early 00s spate of adult fairytale adaptations – Red Riding Hood (2011), Mirror Mirror (2012), Snow White and the Huntsman (2012) and Hansel & Gretel: Witch Hunters (2013) – with the likes of Grimm’s Snow White (2012), Hansel and Gretel (2013) and Sleeping Beauty (2014). The fact that the original stories are in public domain has meant they are free to serve up copycat works. Jack the Giant Killer was clearly intended to act as a copy of Bryan Singer’s Jack the Giant Slayer (2013) and was released to dvd ten days later. Both films are based on the fairytale of Jack and the Beanstalk. This film is no relation to the earlier fantasy adventure Jack the Giant Killer (1962). As soon as you go into Jack the Giant Killer expecting a reworking of Jack and the Beanstalk, your head begins to hurt. The fairytale is set in a mythical Mediaeval past but in the opening scenes we see Jack (Jamie Atkins) going up against a triceratops-like beast in a ramshackle Transformer-styled battle suit. It becomes apparent that this version is set in present-day England and, like the tv mini-series Jack and the Beanstalk: The Real Story (2001), concerns itself with the present-day descendant of the original Jack. The film starts to get into even stranger territory when it journeys up into the Land of the Clouds. Introduced into the mix is a witch (played by Jane March, essentially doing a variant on the same role that she did in Grimm’s Snow White). The film becomes even more fascinating when Jamie Atkins encounters a castle that turns out to be a magical coal-powered flying device – shades of Howl’s Moving Castle (2004) one kept thinking. Moreover, it is run by the hero’s father (Harry Dyer) who is only the same age as he is due to a strange timewarp that means time in the Land of the Clouds passes more slowly than it does back down on Earth (and aspect that is frustratingly never explored any more than that). Up until the point of its return back down to Earth, Jack the Giant Killer has been holding offbeat promise. The thing you cannot help but notice is that despite being called Jack the Giant Killer, there are no giants in the film. 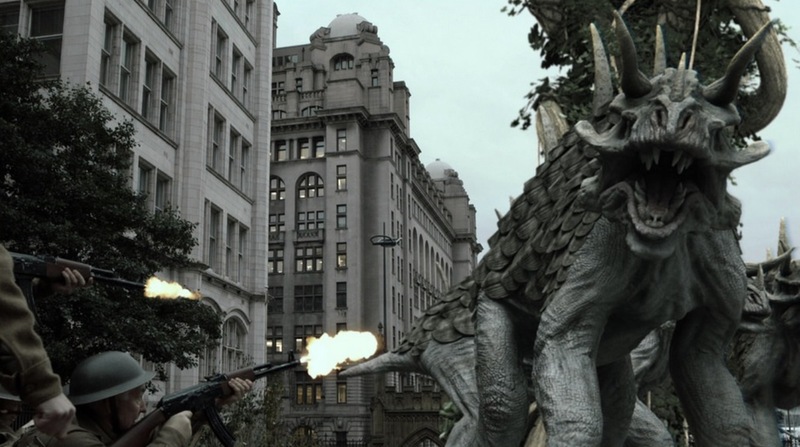 Jack does get to battle a horde of triceratops-like beasts, which vary in size between the size of trucks and ten story buildings thanks to the typically cut-price Asylum in-house digital effects but it does seem a cheat to be describing these as giants. Despite some initial imaginative promise, the latter half of the film only consists of various of the cast and military hunting Jane March and her wannabe dinosaurs around the English countryside. Though promising to give us a fairytale adaptation, all that Jack the Giant Killer ends up being is a glorified monster movie. Director Mark Atkins is an Asylum regular was has also made Halloween Night (2006), Allan Quatermain and the Temple of Skulls (2008), Dragonquest (2009), The Haunting of Winchester House (2009), Princess of Mars (2009), Battle of Los Angeles (2011), Sand Sharks (2011), Alien Origin (2012), Knight of the Dead (2013), Android Cop (2014), Dragons of Camelot (2014), P-51 Dragon Fighter (2014), A Perfect Vacation (2015), Road Wars (2015), Planet of the Sharks (2016), Empire of the Sharks (2017), Jurassic School (2017) and 6-Headed Shark Attack (2018).